Alice Jemima Gibson was born in Australia and married Mr Kelso. The couple had one son, Edgar, who was educated at Scotch College in Melbourne and later at Melbourne University. The family moved to Goulburn, where Edgar started the King College for Boys. After her husband died, Alice Jemima remarried, becoming Mrs Finlay and lived at Taranna in Goulburn. She died in 1911. 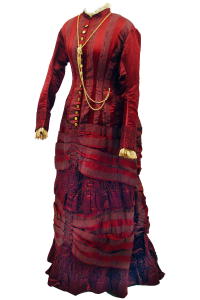 This plum taffeta and burgundy satin day gown was made by Farmers and Co. of Sydney and was worn by Alice in the 1880s. The gown exemplifies the late Victorian bustle period of the time. The bustle was used in various forms during this time to support and distend the shape of a gown, creating fullness at the hips or back, using horsehair, wire frames or cane hoops. The gown is a one piece princess-line fastened down the front with gold buttons with hand worked button-holes. Ruched lace decorates the high neckline and sleeve cuffs, while woven stripes of the fabric adorn the skirt.